Kids love campfires. Cooking food out of doors under the stars is much more exciting than eating indoors. It’s not only more fun campfire food, even though it’s charred around the edges, tastes better. Make sure you’ve got plenty of foil and some matches, as well as the food you’re going to cook. And keep a bucket of water handy to douse over-enthusiastic flames. So whether it’s a campsite for the night, or they’ve pitched their tent in the back garden, get out there with them and start rubbing the sticks together! Fry the bacon until crisp then wrap it in foil and keep it at the edge of the fire. Fry the bread in the bacon fat in the pan. Add it to the bacon to keep warm. Scramble the eggs, with a seasoning of pepper, in the bacon pan until lightly cooked. Return the bacon and bread to the pan and eat! Cut the top off the tomato and scoop out the inside. Discard the seeds but mix any flesh with some tuna and some chopped spring onion. Use this mixture to stuff the tomato. Sprinkle with grated cheese or top with a slice of cheese. Wrap securely in foil and place in the coals until heated through and the cheese is melted. Open the pita pocket. Spread one side with tomato sauce. Sprinkle in some grated cheese (or slices of mozzarella). Wrap in foil. 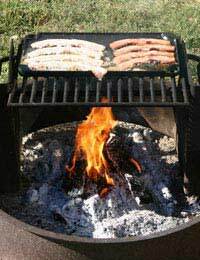 Cook over the coals until heated through – about 20 minutes. Add other fillings: mushrooms, peppers, tuna, salami, olives. Cut a cob in half. Place on a piece of foil. Add a knob of butter and wrap tightly. Cook on the fire for about 20 minutes or until cooked to your taste. Brush the potato with oil and rub in salt. Cut slices ½” apart (not the whole way through) and place a thin slice of onion in each gap. Wrap tightly in foil and cook in the coals for 20 minutes. Remove from the heat and carefully unwrap. Place a slice of cheese on top of the potato and wrap it up again. Return to the heat for another 20-25 minutes until the potato is soft. Brush a double-layer sheet of foil with oil. Make a cut in the chicken breast deep enough to pop in a slice of ham and a slice of cheese. Press the breast together and place on the foil. Pour over some barbecue sauce. Wrap securely and cook over the fire for 40 minutes, turning occasionally. If you don’t have a grid to cook on, put a rock close to the fire edge. Brush a double-layer sheet of foil with oil. Place the burger in the middle. Finely slice the potato, onion and carrot. Place the vegetables on top of the burger. Wrap the foil securely. Cook on the coals, turning occasionally, for about 30 minutes or until well-done. Serve with ketchup. Don’t peel the banana but cut into it, lengthways. Pull it apart very slightly. Stuff marshmallows and chocolate chips into the gap. Wrap the banana securely in foil and cook on the coals until heated through and the chocolate has melted. Use a spoon to eat direct from the peel. Alternatively, you can skewer the banana and hold it over the fire until the filling has gone gooey.